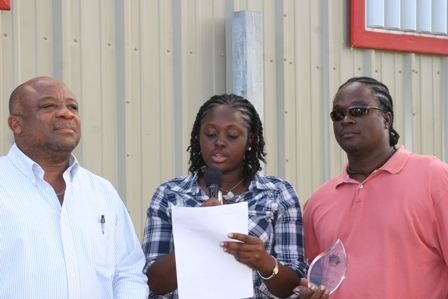 NIA-CHARLESTOWN NEVIS (January 31, 2011) — Nevisian entrepreneur Mr. Marcel Forbes of Marcel’s Structural Metal Works formally of Low Street in Charlestown, was visibly beaming with pride when he received an award from the Youth Division in the Ministry of Social Development on Friday for his faithful and outstanding work in the field of welding. The award was presented to Mr. Forbes by Minister of Youth and Social Development in the Nevis Island Administration (NIA) Hon. Hensley Daniel at his Nugent’s Heights business premises, as part of a youth initiative to salute and award all the youths of Nevis. The award according to Youth Coordinator in the Youth Division Mrs. Diana Pemberton was the first of many which will be presented in similar pattern to deserving youths who have performed in selected fields to mark the August 2010-2011United Nation’s International Year of Youth. “We are going to pick a youth each month of this year, to commemorate the International Year of Youth which will go on to August 2011 but from the Ministry’s standpoint we will be saluting one youth per month this year in various areas such as performing arts, education, construction also volunteerism and sports. So Mr. Forbes you are the first of many and we salute you,” she said. In response an elated Mr. Forbes said he was thankful that his work was acknowledged and thanked Minister Daniel and his ministry for the award. In brief remarks Mr. Daniel said the Ministry recognised the importance of young people in the development of the society and as such had come to celebrate with Mr. Forbes. The Minister used the opportunity to encourage the youth of Nevis to follow in the path of the first awardee and with hard work, diligence and commitment to duty they too would be celebrated by the Ministry. He also noted that the Ministry was minded that two thirds of the population were youths and it was imperative that their achievements were celebrated. “Marcel Metal Works as you know makes gates and a wide range of metal products which are made available to the public in Nevis and Marcel having been involved in this business for many years. We think we owe it to him to say thank you and to say [and] we appreciate your contribution to the development of Nevis. We would like you to use this simple award that we will present as an incentive to give you further fillip to move forward. “We want the young people of this country to see that there are young people who are making positive strides and we want them to copy you. We know that you have done that because you have been able to attract a number of young people to work with you but larger than that, we want the young people of the country to get on board in doing positive things and this is one way to start,” he said. Mr. Daniel noted that Mr. Forbes had sought to hone his skills in metal work over the years locally and overseas. He had benefitted from training at the Metal Industries Company Ltd. in Trinidad the same facility which the Nevis Island Administration had sent a number of young persons for skills training over the past two years. One such student is at present employed by Mr. Forbes. Meantime, in a profile read by Ms. Infatari Hanley, the awardee’s daughter, she described him as an ambitious, energetic, jovial and proud individual. He attended the Charlestown Boys and Charlestown Secondary Schools. He took advantage of an opportunity to be a part of a youth skills programme and was attached to Classical Metal Works owned by Mr. Nia Conrad Liburd. While there he was trained as an apprentice to weld and also engaged in other activities related to the business. On completion of his secondary education he succeeded in securing a job at Classical Metal Works where he worked for eight years. It was during his tenure there that Marcel discovered his love and deep interest in metal works and felt the need to establish his own business. Enthusiastic about his achievements in life, Marcel was able to secure a loan from the Foundation for National Development (FND) which assisted him with setting up his business operations. He started off by himself on a 500 sq ft plot of land under a shed at Government Road but was able to purchase the necessary machines and material to successfully carry out his welding business. “It was only then that he started to put his skill to use, he attracted many customers and was able to be acknowledged as a welder in the community. The Caribbean Development Bank saw his potential and saw him off to Trinidad in 2002 for further training. There he attended a nine week training course at the Metal Industries Company Ltd.
“On completion of the course he obtained a certificate that qualified him to be an Industrial Welder and in 2006 he attended a five day workshop in St. Lucia for Management Skills and Book Keeping. He then hired a labourer which assisted him with his work. After that he was able to employ more and more persons and his business was increasing,” she said. At that time work from Marcel’s business was highly regarded and acknowledged in the community Ms. Hanley said and pointed to Marcel’s insistence on training his employees to assure quality products. However, 15 years later he was able to acquire a 9979sq ft. parcel of land at Pinneys Industrial Site and erected a steel frame building. He was also able to purchase more state of the art equipment. “Marcel continues to be an ambitious entrepreneur as he has a passion for producing quality goods and provides the best service for his customers…The business has made significant financial contributions to Culturama shows, schools, graduations and gives back to the less fortunate. “His future plans are to build a temple for welding and open a hardware store that sells all kinds of machines and electronics. He also plans to open a metal school to teach the trade to young Nevisians, thus keeping them on a straight and narrow path,” she said. Ms. Hanley said with continuous hard work, perseverance, help from God alongside his family, friends, customers and a growing hard working and dedicated labour force, her dad’s business will continue to provide the best service and produce nothing but the best quality products from metals. “One of his favourite quotes is the sun will never set on his business giving him the drive to push on,” and in the words of her dad admonished the youths to keep a goal in mind and work hard to achieve it.